Movie Matchups: DreamWorks Animation Triple Feature! Over the past few years, the quality of DreamWorks Animation’s films has gone up dramatically. They’ve given Pixar a run for its money with great movies like Megamind, How to Train Your Dragon and Kung Fu Panda. What has suddenly changed at DreamWorks? I think I know the answer: They discovered they’re good at telling a story. In fact, they realized they do such a good job at it that they’ve told the same story three times! If it ain’t broke, don’t fix it. I’m going to show how the stories of Megamind, How to Train Your Dragon and Kung Fu Panda are identical. This is a bit ambitious for me because I usually just compare two films. Wish me luck. Now sit back and enjoy this new, exciting adventure! All three films begin with narration introducing the main character. The main character is a social misfit who is one of a kind in his village/world. A sudden crisis puts the misfit in charge while the leader disappears. There’s a training montage in which a character learns new skills. There’s a scene where the misfit is falling a huge distance. An evil force threatens to destroy the misfit’s village/city. The misfit has a loss of faith and everything seems hopeless. Several side characters fail to defeat the main villain. The misfit comes up with a crazy plan using skills he’s learned along the way. The misfit comes to the rescue just in time and takes on the main villain in a life-or-death fight. It looks like a character is either dead or dying at the end. An extended opening monologue establishes what each film will be about. Megamind begins with the titular character describing his origin story. It’s a clever sendup of Superman’s famous deliverance from the doomed planet of Krypton. The dialogue is a hilarious juxtaposition to the images we see, and it sets the tongue-in-cheek tone for the film perfectly. How to Train Your Dragon starts with a superb action sequence that’s narrated by the main character Hiccup. This is a great opening because it shows the main conflict of humans vs. dragons, and it establishes all of the relationships between the characters. Plus, it makes the audience eager to see more. Kung Fu Panda starts with Po narrating a dream sequence where he fantasizes about being the greatest warrior in all of China. It’s a beautifully animated sequence, and it’s a fun contrast to Po’s mundane life as a waiter. But, like Belle in Beauty and the Beast, he dreams of being so much more. The main character is totally unique in his world. Megamind is an alien who is the only survivor of his home world. 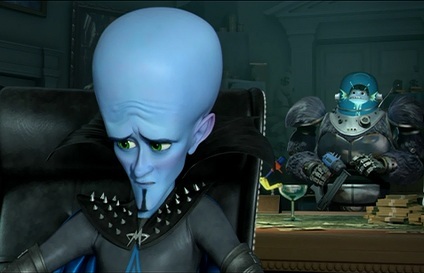 Metro Man is also the only survivor of his planet, but they’re clearly two different races, seeing as how Megamind has a “giant blue head” and all. He pronounces words like “Metrocity,” “school” and “melancholy” in odd ways, and he doesn’t fit in well with others, even when he tries. As the film progresses, we see that he’s actually a bit misunderstood. He’s not really interested in hurting anyone – he’s just filling the role he thinks he was born to fill. Hiccup is short and scrawny in stark contrast to the tall, massive Vikings. He uses his mind to solve problems rather than just brute force. But he often makes mistakes and causes more problems than he solves. Although he wants to fit in with the other Vikings, he can’t bring himself to kill dragons like everyone else does. Everyone, including Hiccup, considers that a fatal flaw, but it actually becomes one of his greatest strengths. Po is the only panda we ever see in Kung Fu Panda. Most of the other villagers are pigs and geese. 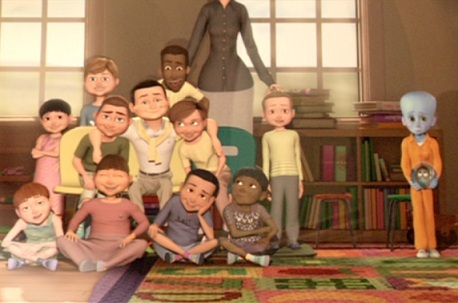 You could argue that all of the Furious Five and their leaders are unique, as well. But none of them seem out of place in their world the way Po does. He doesn’t fit in with the villagers, and he certainly doesn’t belong with the kung fu masters. Every story needs a good crisis to create tension and drama. It just so happens that these three films have very similar crises. Megamind is probably the most different of the three, so I’ll talk about it last. In How to Train Your Dragon, the Vikings are struggling to survive in the face of constant dragon attacks. Their leader Stoick takes most of his people on a dangerous mission to try to get rid of the dragons once and for all. While he’s away, his son Hiccup rises to become the best dragon-hunting trainee the village has ever seen. But he never hurts the dragons; he just uses harmless techniques to disarm his opponents. In Kung Fu Panda, Po is chosen to be the Dragon Warrior just as a bad guy named Tai Lung escapes from his prison. 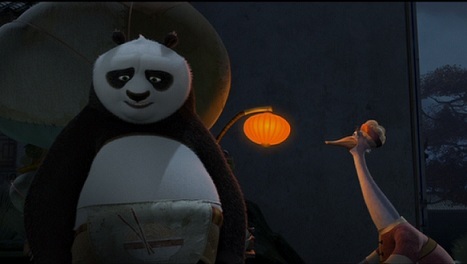 The Furious Five leave immediately to deal with the threat, leaving Po alone with his trainer Master Shifu. Megamind is a reversal of the typical hero-villain plot. The main character is the villain, and he manages to triumph over the hero at the start. Once Metro Man is gone, Megamind is left in charge of the city, similar to the other stories. But the crisis comes because of his own mistakes, which is different than the other two films. 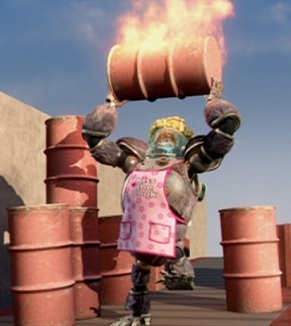 Over the course of the movie, Megamind unwittingly becomes more heroic until he turns into the very thing he used to hate: Metro City’s savior. He creates a hero with Metro Man’s powers as a counterbalance to his villainy. Unfortunately, he couldn’t have picked a worse guy for the job because soon the new “hero” is doing more evil deeds than Megamind ever contemplated. A training montage shows a character learning to master his newfound skills. Megamind accidentally imbues a nobody named Hal Stewart with Metro Man’s powers. He gives Hal the superhero name Titan and helps him learn how to properly fly, use his laser vision and save people. It’s not an easy task. I love how they incorporate Donkey Kong, Marlon Brando and other hilarious references into these scenes. In How to Train Your Dragon, Hiccup finds a dragon trapped in a valley because its tail has been damaged and it can’t fly. Hiccup figures out the dragon needs a new tail, then he needs a way to control the new tail’s movements, then a safety harness, etc. After a lot of trial and error, Hiccup and his new pet dragon (who he names Toothless) figure out how to work together to successfully fly. This whole montage feels a lot like the part of Batman Begins when Bruce Wayne learns what tools he needs to fight crime. After the Furious Five depart, Shifu teaches Po how to be a kung fu master through creative tactics involving food. The food-loving panda quickly catches on, and soon he’s ready to become the Dragon Warrior. The film has set up Po as a funny character, but we haven’t seen him demonstrate any special martial-arts ability until now. The fact that they can believably establish him as a warrior after so much silliness is an incredible feat. This is a small detail, but each of these films shows a character falling a long way at least once. When Megamind finally confronts Titan in a fistfight, he gets thrown high into the air and begins to fall to his death. He comes up with a clever solution to save himself, though. 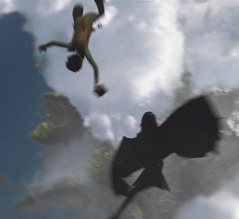 On their first real flight together, Hiccup and Toothless get separated in midair and fall dangerously close to a mountain. At the last second, they manage to come back together and maneuver through a deadly group of rocks. This is one of my favorite parts of the movie because it’s thrilling while also moving the story forward and showing how much the characters have progressed. Kung Fu Panda has multiple scenes of characters falling a ridiculously long distance, though these scenes are usually played for laughs. Po falls off a rocket-powered chair to land right in front of Tigress at a tournament. 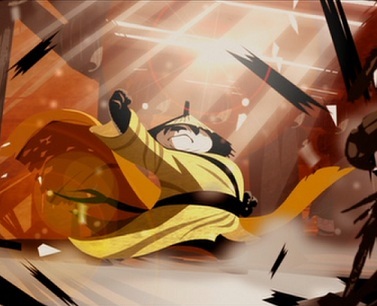 He also gets knocked down a mountain twice, once by Shifu and once by Tai Lung, but he’s never in any danger of dying because his fat cushions his falls. Tigress jumps off a mountain and falls off a bridge. Tai Lung bounces off Po’s belly, sending him hurtling into the sky for several seconds. Although this gag is repeated several times, they find different ways to show it, keeping it from getting stale. What’s at stake in all three movies is the destruction of an entire city. Titan turns from superhero to supervillain faster than you can say “Ollo.” And he goes around burning his name into city blocks, demolishing buildings and making Metro City his own personal playground. The film does a good job foreshadowing this destruction near the beginning when Hal gets angry and punches his news van. He cradles his hurt hand and gets even more frustrated, banging his van into a streetlamp as he speeds off. If he can throw tantrums when he’s just a regular guy, it’s scary to think what he’ll be capable of with superpowers. In How to Train Your Dragon, at first we think the dragons are the main threat. But we later learn that they’re just acting under orders from a huge dragon that seems to be their master. The dragons have to steal food from the Vikings’ village or be killed. This means both the humans and the dragons are in danger of extinction, which is a clever twist. In Kung Fu Panda, Tai Lung used to be Shifu’s student until his ambition drove him to try to destroy the entire Valley of Peace. Now he’s coming home to finish the job and take what he thinks is rightfully his. You can sort of feel for Tai Lung’s plight. He trained his whole life to be the best he could be, and then he was denied the one thing he dreamt of being: the Dragon Warrior. He’s not eager to be a ruler; he’s just frustrated. The hero loses all hope and gives up for a time. Megamind discovers Metro Man isn’t dead, but even though he’s perfectly capable of helping, he won’t stop Titan’s reign of terror. This terrible blow – that Megamind failed to defeat his nemesis, but was simply handed victory, and that the hero he always believed in is now just a shadow of what he was – makes him decide that there’s no chance of victory or even survival. Everything Megamind used to know for certain has been called into question. He doesn’t know what to believe in anymore, but one thing he does know is that he definitely doesn’t believe in himself. He resigns himself to returning to his “home” in prison. Hiccup makes a desperate attempt to show his father and his village that the dragons aren’t dangerous if they’re treated kindly. But the whole thing goes sour, and Stoick disowns him and casts him aside, thinking he’s betrayed his village. Hiccup feels powerless to help Toothless or his village as they’re put into serious jeopardy. This is an example of a good misunderstanding. Unlike the ridiculous one in Hitch, this doesn’t feel like it’s ripped straight out of a sitcom. Stoick has never really listened to Hiccup, so it makes sense that he wouldn’t listen to him now, especially when he thinks Hiccup has betrayed everything he believes in. The characters are doing their best under the circumstances, not acting foolishly just to serve the plot. Po learns that the ultimate power that was supposed to be contained in a mythical Dragon Scroll is really nothing. There is no secret to becoming the Dragon Warrior. He realizes he’s no match for Tai Lung so he flees for his life with the rest of the villagers. I must admit it was disappointing to learn that the writers of Kung Fu Panda couldn’t come up with something to live up to the hype around the Dragon Scroll. It feels like a copout to just say it’s nothing. But it works okay within the framework of the story, so I can let it pass. It’s definitely one of the weaker things about this movie, though. While the main character wallows in self-doubt, his friends go and try to solve the problem for him. Megamind’s sort-of girlfriend Roxanne Ritchi confronts Titan and tries to convince him to stop his senseless destruction of Metro City. But he won’t listen to her, and he threatens to kill her unless Megamind can stop him. Roxanne pleads with him to save her and the city. It’s interesting to note that in all three cases, a loved one brings the hero to his senses. 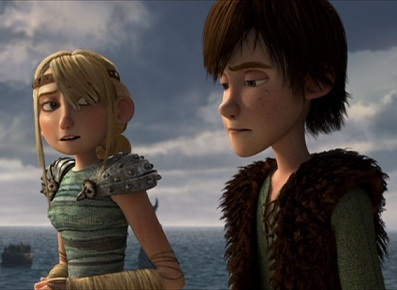 In How to Train Your Dragon it’s Hiccup’s girlfriend Astrid, and in Kung Fu Panda it’s Po’s father. Stoick forces Toothless to lead the Viking fleet to the dragons’ nest. He plans to destroy it and force the dragons to find a new home far away from their village. But he finds himself in over his head when he confronts their leader. Soon all of the Viking’s ships are destroyed and it looks like they’re not going to survive. This is the first time we really see Stoick look fearful. He’s always known exactly what to do, even when his men showed signs of worry. But now he’s led them to their deaths. He responds by bravely but foolhardily attempting to distract the dragon and let at least some of his people escape. In Kung Fu Panda, first the Furious Five get defeated by Tai Lung, then Shifu. Even the most highly trained kung fu masters are no match for the fearsome snow leopard. He seems like an unbeatable opponent, making Po’s plan to take him on almost suicidal. The main character eventually finds a flaw in the villain that he tries to exploit. When Roxanne is threatened by Titan, Megamind finds the courage to risk his life in defense of her and Metro City. He comes up with a brilliant plan involving his shape-shifter watches and his other high-tech gadgets to fake out Titan and get him to leave town. Hiccup realizes that dragons aren’t fireproof on the inside, so he hatches a plan to rescue Toothless and kill the main dragon with a well-timed shot of Toothless’ lightning breath. He gets all of his friends together to put his plan into action. This is a great plot twist that’s both perfectly natural and very rewarding. After seeing the young Vikings being trained to kill dragons, it’s nice to see them teaming up with the dragons instead. Po figures out the riddle of the Dragon Scroll: there is no secret ingredient. You just have to believe in yourself and you can accomplish anything. With this knowledge, he hurries up the mountain to help Shifu before it’s too late. He doesn’t come up with a plan, per se; he just knows that there’s at least a slim chance that he could actually emerge the victor in this fight. His opponent’s weakness is that he doesn’t believe in Po’s abilities, so he is constantly underestimating him. Po’s strength is that he does believe in his own abilities. Just in the nick of time, the main character shows up to save his friends. Titan is preparing to kill Roxanne when Megamind makes his grand appearance. His plan seems to work at first. He pretends to be Metro Man, but when his cover is blown he has to resort to desperate measures to win. Megamind distracts Titan just long enough to extract his superpowers. This is the only action sequence in the whole movie that feels completely legitimate. They’re not making many jokes to try to diffuse the tension, but playing it straight instead. The main dragon is about to kill Stoick when Hiccup and his friends fly in and start harassing the beast. With Toothless’ help, Hiccup brings the main dragon to a fiery end. The fact that Hiccup’s friends are barely effective at distracting the main dragon highlights the fact that only Hiccup and Toothless are a real match for the massive creature. It’s dramatic to see all of the Vikings, including Stoick, watching helplessly on the sidelines as Hiccup nearly gets engulfed by flame time after time. Tai Lung is choking the life out of Shifu when Po arrives, winded from his long climb. Po challenges Tai Lung to an epic battle. It is definitely the best part of the movie. Tai Lung’s paralyzing attack, which was so effective against the Furious Five, is harmless on Po. His ample body fat makes him impervious to even the most deadly attack. That’s what makes him the Dragon Warrior. He alone is capable of defeating Tai Lung because he seems so harmless. Soon he gains the upper hand and turns all of Tai Lung’s strengths against him, winning the battle with ease. After the battle, it looks like one character is a goner. In Megamind, it’s Megamind’s loyal friend Minion. He is a fish in a glass fishbowl on top of a mechanical gorilla suit. Unfortunately, Titan shattered his fishbowl, and he is suffocating. But the crisis turns out to be overblown because Megamind just tosses him into a nearby fountain and he’s fine. This works well with the film’s constant barrage of jokes turning potentially serious moments into silly ones. In How to Train Your Dragon, it’s much more serious. Hiccup is knocked off Toothless and falls into the exploding dragon before Toothless can reach him. The Vikings think Hiccup is dead, but it turns out Toothless shielded him from the brunt of the explosion, though he lost one of his feet in the fire. I love this new development because it takes the film’s themes of loss and sacrifice and makes them deeply personal to the audience. It turns out that this whole time we’ve been seeing the last time in Hiccup’s life that he would be completely whole. That makes the film more special. 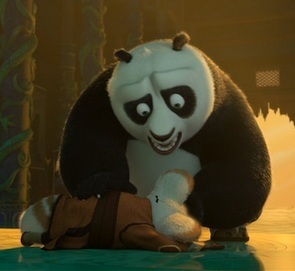 Kung Fu Panda fakes out the audience by making us think Shifu is dying. Po tells him that Tai Lung is defeated, and Shifu thanks him, closing his eyes and speaking quietly, as though he’s slowly dying. When Po yells at him not to die, Shifu shocks him and the audience by shouting back, “I’m not dying, you idiot… uh, Dragon Warrior! I’m simply at peace.” This is a brilliant moment because Shifu was convinced he would have to die to atone for his terrible mistake in training Tai Lung. No matter how many others he taught, he thought he would always feel like a failure. But his training of Po made up for everything. He would never have chosen Po as a student. But Po’s dedication and pure heart made him an ideal student in contrast to Tai Lung’s ambitious, arrogant heart. So there you have it. Three of DreamWorks’ recent hit films have virtually identical plots. Sure, they focus on different things and they throw in little twists and unique characters, but the framework is still the same. If you think about it, you can describe all three of these movies with the following sentence: A social misfit learns to believe in himself and saves his city from an evil threat. What more needs to be said? All photos from Megamind, How to Train Your Dragon and Kung Fu Panda are the copyright of DreamWorks Animation. This entry was posted in Movie Matchups and tagged animated films, batman begins, beauty and the beast, comedy, donkey kong, dreamworks, films, fun, funny, hitch, how to train your dragon, kung fu panda, megamind, movie review, movies, pixar, relationships, science fiction, superman. Bookmark the permalink. 5 Responses to Movie Matchups: DreamWorks Animation Triple Feature!